In response to The Daily Post’s weekly photo challenge: “(Extra)ordinary,” here are some leaves from an extremely ordinary tree. Turkey oaks are all over Florida. They’re so common you kind of stop seeing them after a while. They are scrubby, brittle trees that fall over if you look at them wrong. But that’s fine, because a hundred little saplings will sprout from the roots. I took this on a cold morning a few years ago, when I was helping with a bobwhite quail survey in the Florida panhandle. I arrived at dawn, took up my post on a specific point at the edge of a field. It was a very cold morning for the area, and there was still frost on the leaves and grass as the sun rose. 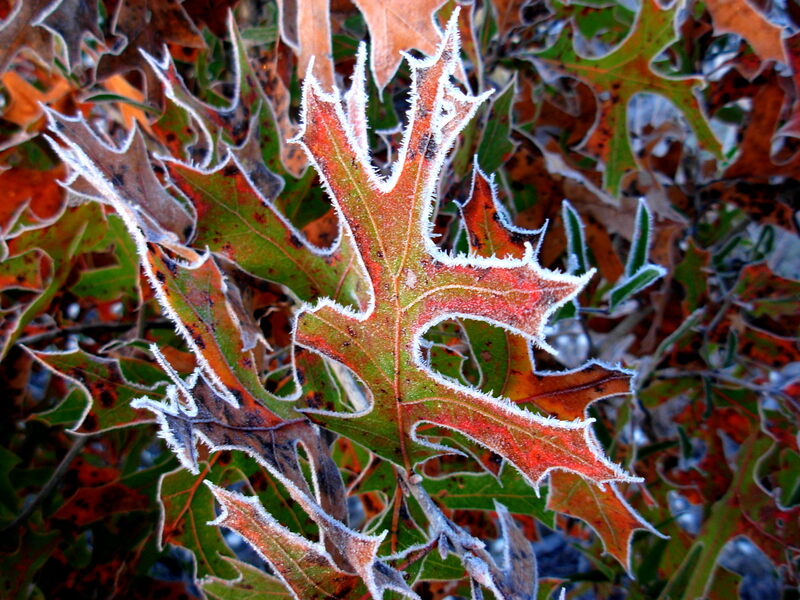 It made even the ordinary, scrubby, weed-like turkey oaks beautiful. I took a couple of pictures and then stood there, shivering, and listened very hard. After a while, I almost started to hallucinate possible quail calls. Then I heard some real ones that reminded me of what they really sound like. You can hear it, too. Great timing! On my bike ride, 2 days ago, I was astounded at the number of Californian quail I saw. I swear, if there’s such a thing as reincarnation, all neurotics come back as Californian quail. You cannot watch those quail run, without smiling. We live in a beach/rural area with lots of sand dunes and scrubby areas, and lots of small ponds so, now that it’s spring, there are bird families everywhere. Quail, ducklings, cygnets, pukeko, pheasants – I even saw a golden pheasant a couple of weeks ago. Lucky there ‘s not a lot of traffic around, the number of times I’ve almost fallen off my bike, trying to get a better view. Next Next post: Be careful — it’s a long way down!